EAST AURORA, N.Y.--(BUSINESS WIRE)-- Astronics Corporation (Nasdaq: ATRO), a leading provider of advanced technologies for the global aerospace, defense and semiconductor industries, announced today that its wholly owned subsidiary, Astronics PGA, has been selected by AMAC Aerospace to provide VIP entertainment and cabin management systems for a widebody interior completion on a Boeing 747-8i VIP jet. 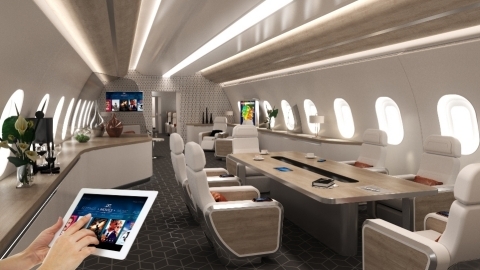 Under this contract, Astronics PGA will provide a VIP inflight entertainment and connectivity (IFEC) system plus a VIP cabin management system (CMS). The new IFEC system will include the latest technologies, such as ultra-high definition (4K) screens, touchscreens, 4K audio/video sources, and passenger control units. It will also include digital rights-managed (DRM) content for entertainment delivery. The CMS system will control the entire cabin environment from lighting and temperature to door and window shade operations. Astronics PGA is an innovator of in-seat motion systems, lighting systems, inflight entertainment and connectivity systems (IFEC), and cabin management systems (CMS) for business, VIP, and commercial aviation. For more details on VIP inflight entertainment and cabin management systems, visit Astronics.com.